Over the years, many patients have had their smile positively enhanced by our talented team of dental professionals. We encourage you to read through the information provided below so that you can become more familiar with dental care in Fargo provided by Lundstrom Family Dentistry. As a native of Fargo I have enjoyed building my practice in an area that I call home. After receiving my undergraduate from Concordia College in Moorhead; I continued my education at the University of Minnesota where I graduated in Dentistry in 1993. I have been a practicing dentist for 26 years and strive to provide comprehensive care and individualized treatment planning in a professional and caring environment. 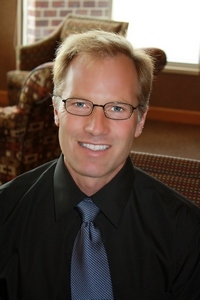 I have a passion for Cosmetic Dentistry and am excited about a growing practice. Changing someone’s smile can truly alter their life and I am blessed to be able to give that opportunity to my patients. Cosmetic Dentistry is a challenge I enjoy and find rewarding not only for my patients but for myself and my team as well. My wife Michelle and I stay busy with our 4 kids, Matthew, Sarah, Andrew and Megan. We enjoy going to their sporting activities and just watching them grow up. Some of our favorite hobbies include hunting, fishing, and water skiing!